Page 2 of The Mythic Roots of Western Culture’s Alienation from Nature. Adams and Belasco. Tapestry Institute Occasional Papers, Volume 1, Number 3. July, 2015. Outline / List of Headings available here. Two primary views of nature in Western culture are Idyllic and Ruthless. 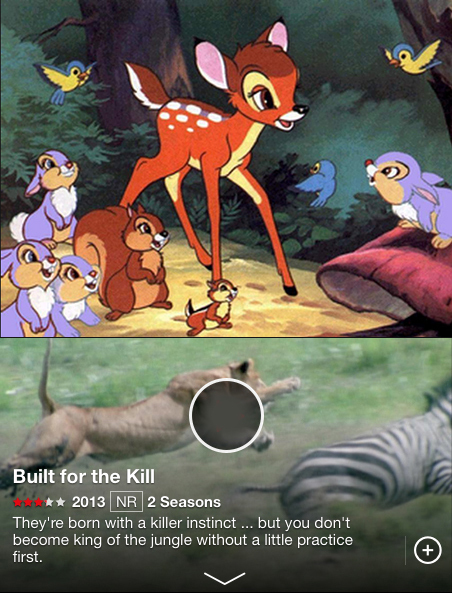 The film Bambi (top) portrays the lives of wild animals as idyllic (9), whereas the documentary Built for the Kill (bottom) tells us that wild animals endure terror and pain in a ruthless struggle for survival (10). The lower image is a screen grab from a video site whose text description is part of the motif represented here; the gray circle is where the “play” arrow used to be. See refs. 9 and 10 for full film credit information. Images used under Fair Use as stated in the Copyright Act of 1976, 17 U.S.C. § 107. Images and narratives from popular culture provide a place to start our exploration of how and why Western culture sees nature the way it does. Two very different and diametrically opposed views of nature exist. Nature is seen as either an Idyllic environment in which animals live in joyous harmony, or as a Ruthless environment in which animals experience an endless, bloody struggle for basic survival. The first view is generally perceived as naïve and childish, whereas the second view is often considered more adult and realistic. These two views generate four different motifs of human-nature relationship. 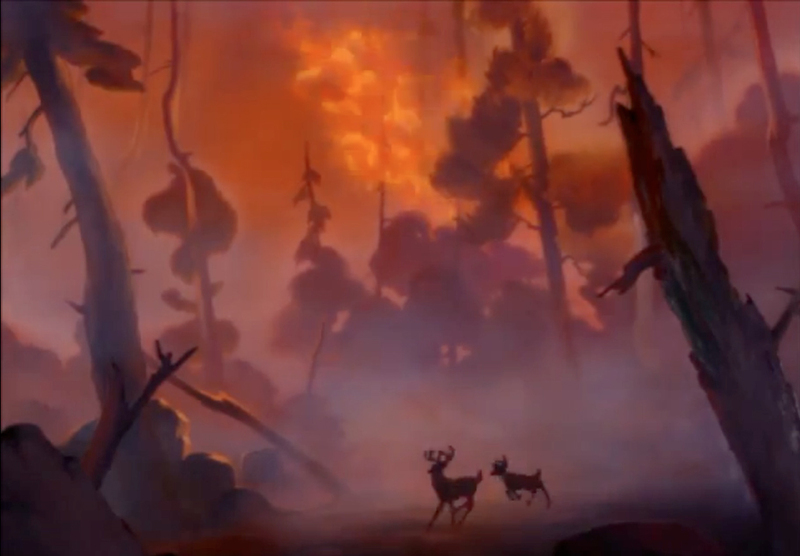 In Bambi, humans set the forest on fire, which results in tragedy. In the Animals Only motif it’s best for the animals and the forest itself if humans stay far away and do not engage with nature at all. See ref. 9 for full film credit information. Image used under Fair Use as stated in the Copyright Act of 1976, 17 U.S.C. § 107. In the Idyllic view of nature, there are two motifs of human-nature relationship. In the Animals Only motif, humans are excluded from nature for the good of nature itself. When the animals in Bambi warn one another “Man is in the Forest,” it signals impending violence and death. This motif is expressed even more strongly in Felix Salten’s original novel than in the Disney film; a deer who makes friends with humans and insists positive relationship with them is possible pays a terrible price for that view. Crucial aspects of policy development for wilderness areas and parks are often based on the Animals Only motif and its assumption that human presence is always destructive to nature and must therefore be tightly regulated or even prohibited. This generates an important area of conflict between Indigenous peoples and the dominant culture when lands that provide traditional and sacred wild foods are set aside as reserves in which no hunting or fishing are permitted. In the other motif of human-nature relationship based on the view of nature as Idyllic, humans and animals are Best Friends and have the magical ability to communicate with one another. 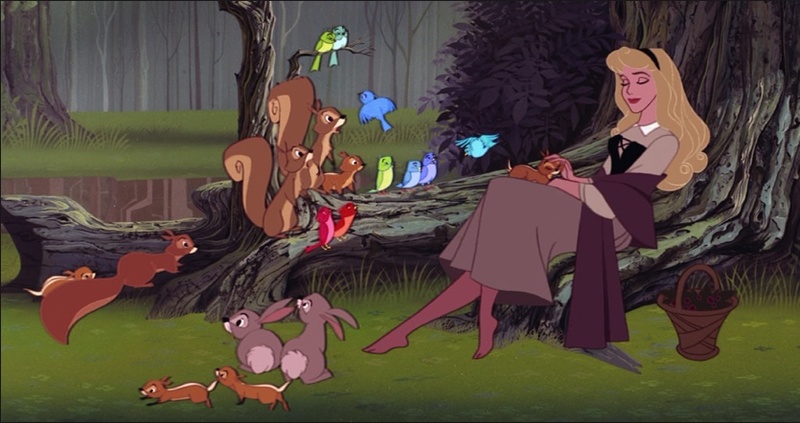 In Disney films such as Sleeping Beauty and Cinderella, birds and small mammals help their human friend by doing her chores, giving her gifts, and tying ribbons in her hair. Visitors to wilderness areas and national parks sometimes act out the Best Friends motif of human-nature relationship by feeding or trying to pet wild animals such as buffalo and bears, frequently suffering serious injury or death in the process. Sleeping Beauty relaxes in an Idyllic nature type of forest with animals, in a Best Friends motif. From Sleeping Beauty (11). See ref. 11 for full film credit information. Images used under Fair Use as stated in the Copyright Act of 1976, 17 U.S.C. § 107. The Best Friends motif can also impact cross-cultural communication between Indigenous and non-Indigenous persons because people of the dominant culture sometimes think Native people relate to animals in a “Disney princess” way, communicating with animals via “supernatural” or “extra-natural” means and experiencing magical events as a result. Red Riding Hood faces the Dark Forest of Ruthless nature with trepidation. From Into the Woods (12). See ref. 12 for full film credit information. Images used under Fair Use as stated in the Copyright Act of 1976, 17 U.S.C. § 107. The alternative view of nature as Ruthless often makes people feel afraid. It’s present in many fairy tales and can be seen in the image of Red Riding Hood walking with great trepidation into the forest in the image to the left. Some anthropologists and biologists see this Fear motif as simply an expression of evolutionary reality: humans instinctively know they are prey and fear predators as a result. In the Fear motif, it’s best for humans to stay out of nature, as it is in the Animals Only motif of the Idyllic view of nature — but this time for the human’s good rather than for the benefit of nature. This type of relationship is seen as a natural consequence of human evolutionary and ecological identity. 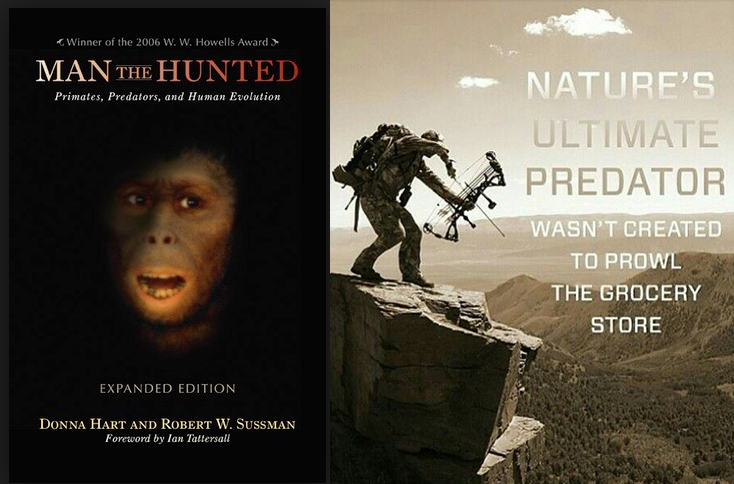 Cover of the book Man the Hunted, showing a terrified human-like primate (left), expresses the Fear motif. A meme expressing the common perception of humans as a “top predator” (right) shows the Master motif. Both are in the Ruthless view of nature. Notice the importance of the weapon and physical position in the second image. Citation information in ref. 4. Images used under Fair Use as stated in the Copyright Act of 1976, 17 U.S.C. § 107. A completely opposite type of human-nature relationship in Ruthless nature view is also said to be an expression of human evolutionary and ecological identity. The Master motif views humans as “top predator,” as popularized by Desmond Morris (13). The Master motif focuses on technology, including tools and tool use, as the key to human-nature relationship, and it extrapolates from actual predators to physical elements of nature such as storms, volcanoes, and drought. So while a movie such as Jaws depicts an actual predator, physical elements of nature also play predatory roles in popular films and stories such as Twister. In that film, a tornado apparently stalks and ambushes the scientist Heroes at the movie’s climax, for example, and a funnel literally growls in several scenes (such as the one below, 14). Movies such as Jaws and Twister usually move characters through a story arc from the Fear motif to the Master motif during the course of the story, with the human Heroes surviving battles with Ruthless nature to win in the end. A tornado literally growls in the 1996 movie Twister. Full citation in ref. 14. Video and image used under Fair Use as stated in the Copyright Act of 1976, 17 U.S.C. § 107. It’s important to realize there are Western views of nature and of the human-nature relationship that are not represented by these motifs or the views of nature that engender them. Transcendentalism, for instance, was (and is) a complex philosophy that doesn’t fit easily into any of the views we’ve identified in these popular culture motifs. That’s all right because we are not attempting to categorize all of Western culture’s ideas about nature and the human-nature relationship in this paper. Instead, our goal is to use major human-nature relationship motifs of popular culture as a key that will allow us to discover the larger cultural Mythic story about nature that informs these images — and therefore the hearts, minds, and actions of many people in the dominant culture. The four motifs of human-nature relationship we’ve seen in Western culture’s two main views of nature do not, by themselves, tell us why people of the dominant culture think the world is the way they see it. Because the Idyllic and Ruthless views of nature are mutually exclusive, if we take them at face value the best they can do is point to the existence of two completely separate views of nature in Western culture. That would leave us trying to understand how and why two such diametrically opposed views came to be distributed through various subpopulations of the dominant culture. It makes far more sense to see these dichotomous views of nature as binaries: subsets or parts of a single whole that’s less readily visible. That less-visible whole in this case would be a major cultural myth. Figure 1. Diagram showing the motifs of human-nature relationship seen in popular culture, and the two major views of nature from which they are derived. This paper seeks to find the underlying cultural myth about nature that gives rise to the derivative levels we’ve explored so far. See text for descriptions of the Idyllic and Ruthless views of nature, and the Animals Only, Best Friends, Fear, and Master motifs derived from those views. 9. Bambi. 1942. Walt Disney Productions. James Algar et al, Directors. Felix Salten, Perce Pearce, Larry Morey et al, Writers. Images on this web page are used under Fair Use as stated in the Copyright Act of 1976, 17 U.S.C. § 107. 10. Built for the Kill. 2001. Granada Wild. Andrew Buchanan, Executive Producer. Naomi McClure, Writer. Images on this web page are used under Fair Use as stated in the Copyright Act of 1976, 17 U.S.C. § 107. 11. Sleeping Beauty. 1959. Walt Disney Productions. Clyde Geronimi, Director. Erdman Penner, Charles Perrault, et al, Writers. Images on this web page are used under Fair Use as stated in the Copyright Act of 1976, 17 U.S.C. § 107. 12. Into the Woods. 2014. Lucamar Productions, Marc Platt Productions, and Walt Disney Pictures. Rob Marshall, Director. James Lapine and Stephen Sondheim, Writers. Images on this web page are used under Fair Use as stated in the Copyright Act of 1976, 17 U.S.C. § 107. 14. Twister. 1996. Jan de Bont, Director. Michael Crichton and Anne-Marie Martin, Writers. Warner Bros., Universal Pictures, Amblin Entertainment, and Constant c Productions. Image used under Fair Use as stated in the Copyright Act of 1976, 17 U.S.C. § 107.